JazzSLC is a non-profit concert series that is produced and funded by the GAM Foundation. The GAM Foundation was founded by Gordon Hanks and Michael MacKay in 1994 in an effort to increase awareness and garner appreciation for our jazz community. 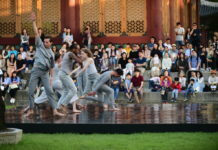 Since its inception, the GAM Foundation has produced more than 200 concerts and featured more than 500 of the finest jazz artists from around the world. In addition, The GAM Foundation has contributed more than $1 million to the music departments of local middle schools, high schools and universities that participate in their jazz education out-reach program. Taking their commitment to budding jazz artists a step further, GAM donates 200 concert tickets a year to local schools with active jazz programs so that students can see first-hand some of the jazz legends that come to Utah. Due to the GAM Foundation’s generous contributions to the jazz community and beyond, the organization has received numerous awards including the University of Utah’s “Excellence in Music” award, the Governors “Special Award” in arts and KUER’s “Voice of Jazz” award, just to name a few. The 2014-2015 season of JazzSLC wraps up in May. Luckily, if you are a jazz fan, you still have three opportunities to be entertained by some of the best. March 30: Manhattan Trinity featuring pianist Kenny Barron, bassist George Mraz and drummer Lewis Nash create a classic jazz sound that will have you tapping your feet and settling in to a night of great music. Barron, named Jazz Master in 2010 by The National Endowment for the Arts, anchors this trio on piano with captivating melodies and soulful rhythms. 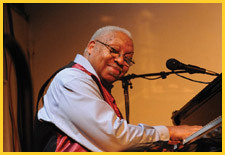 April 13: The Last Southern Gentleman featuring Ellis Marsalis and Delfeayo Marsalis is a masterful collaboration between trombonist Delfeayo Marsalis and his father Ellis, creating a combination of rhythm and blues and up-tempo classic jazz. The Marsalis Family was awarded the National Endowment for the Arts Jazz Masters award in 2011 and brings the classic Southern lifestyle to the forefront in their music. 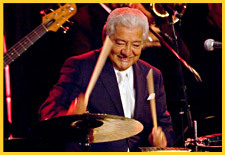 May 16: Percussionist Pete Escovedo and his Latin Jazz band have been entertaining audiences for over 50 years. Known for his ability to merge smooth jazz, Salsa, Latin Jazz and contemporary music, Escovedo is sure to get the hips moving. Escovedo ‘s life performances are a crowd favorite bringing a unique energy and hypnotic sound.